Do you know that only 5% of the fleas are on your pet? The remaining 95% are in your habitat. This is due to the life cycle of the fleas, and how they infest your dog or cat. In what follows, we elaborate on how to effectively fight against these parasites. 1. How does an animal catch fleas? 3. How to combat fleas durably? 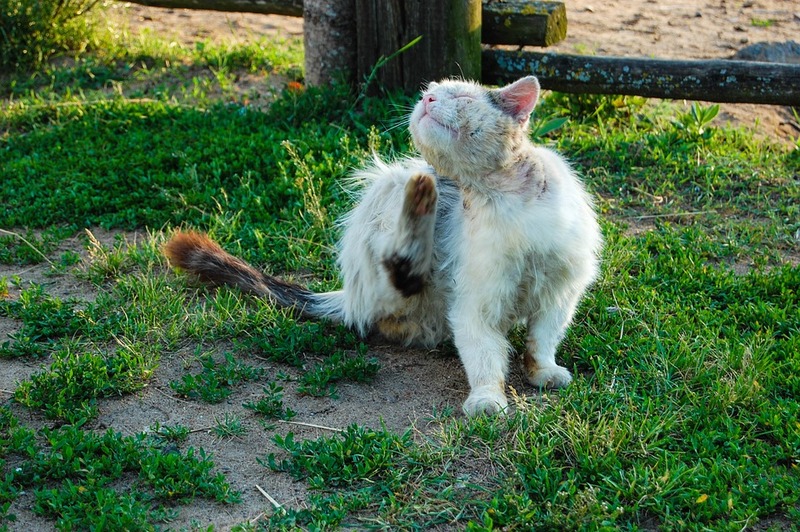 Contrary to conventional wisdom, fleas are rarely transmitted from one animal to another. Why ? Simply because the chips do not make giant leaps! For a transmission to take place, there must be a very close contact between animals. It should be known that the flea is a permanent parasite of the dog: adult, it lives not elsewhere than in the coat of your animal. In reality, fleas that infest your companion are pre-adult fleas, and they are found in the environment: in houses, or outdoors in warm and temperate seasons. Take into account, however, that fleas can also flourish outside during mild winters. The life cycle of the flea is a true vicious circle for the infested animal. When the adult flea lays as it hangs on the animal, its eggs will fall into the environment, then they will turn into larvae, nymphs and then pre-adults, which eventually turn into adults the moment they cling to the animal that passes by. It is extremely rare to detect the presence of larvae with the naked eye in environment, just as a master may not see the fleas on his dog by brushing it. Thus, between the fall of the eggs and the pre-adult stage, larvae, avoiding light, will lodge in the slots of wooden floorboards or carpets. As a result, these regularly aspirated areas will be disinfected. But this is not the case for your cat's favorite drawer bottoms! And, unknowingly, you can also transport eggs under your socks by walking in your house, and spreading them throughout your home. In addition, if it generally takes two weeks between the laying of the egg and the appearance of the chip in the pre-adult state, it may happen that this period of time extends to 6 months, in case of unfavorable conditions such as cold. So you can move into a place that has not seen animals for more than 6 months, and still be surrounded by flea larvae. However, know that the flea droppings can betray their presence on the animal. These are tiny black balls. By taking a moistened blotting paper and crushing them, you can see if they contain blood or not, since it is the food of the chip. In cases of extreme invasion, and in the absence of animals, fleas can also sting humans and attack their legs. 3. How To Durably Fight Fleas? When a dog or cat is infected, it is necessary to act together on the animal as well as on the habitat. To treat the animal, there are several options. Shampoo, pipette, tablet or necklace. Depending on the behavior of the animal and its particularities, it is appropriate for the master and the veterinarian to find the best option. For example, if your pet comes out a lot, a collar may be more easily lost by hanging somewhere; etc. Dr. Arnaud Muller also reminds us that care must be taken not to give a dog a pipette to a cat because some molecules can be fatal to your cat. It should also be noted that collars have evolved considerably in recent years, with non-toxic active ingredients that no longer pose any risk of environmental pollution. To treat the environment, there are global anti-parasite sprays or foggers (insecticides and acaricides). These sprays are used in the absence of occupants and animals in the house, and must be distributed throughout the house. The advantage of sprays is that they make it possible to treat areas like under furniture. Think also of treating the car! Pipettes containing Insect Growth Regulators (IGR), which are applied to the animal, have the advantage of also acting on the environment. How does it work? By falling from the animal, the dying fleas will diffuse the rest of the product and stop the growth cycle of fleas in the larval state. • The environment must be treated when an animal has fleas. It is also advisable to do it in prevention, especially for the animals allergic to the fleas which must absolutely not be bitten. • Do not forget to observe the correct frequency in the treatments. A tablet is usually active one to three months, and a pipette a month in theory. Products containing growth regulators act on animals and on environment. • Treat all animals in the house, even those that do not or seldom come outdoors.